For any possible population of at least ten billion people, all with a very high quality of life, there must be some much larger imaginable population whose existence, if other things are equal, would be better even though its members have lives that are barely worth living. In population A, let’s say we have 10 billion people with a “well-being rating” of +10 (on a scale of -10 to +10, with negative values indicating a life not worth living). Now in population A+, let’s say we have all the people in population A with the mere addition of 10 billion people with a “well-being rating” of +8. According to the argument as Parfit presents it, it seems reasonable to hold that population A+ is better than population A, or at the very least, not worse than population A. This is believed to be the case because the only difference between the two populations is the mere addition of more people with lives worth living (even if their well-being isn’t as good as those represented by the “A” population, so it is believed that adding additional lives worth living cannot make an outcome worse when all else is equal. Next, consider population B where it has the same number of people as population A+, but every person has a “well-being rating” that is slightly higher than the average “well-being rating” in population A+, and that is slightly lower than that of population A. Now if one accepts that population A+ is better than A (or at least not worse) and if one accepts that population B is better than population A+ (since it has an average well being that is higher) then one has to accept the conclusion that population B is better than population A (by transitive logic; A <= A+ <B, therefore, A<B). If this is true then we can take this further and show that a population that is sufficiently large enough would still be better than population A, even if the “well-being rating” of each person was only +1. This is the RC as presented by Parfit, and he along with most philosophers found it to be unacceptable. So he worked diligently on trying to solve it, but hadn’t succeeded in the way he hoped for. This has since become one of the biggest problems in ethics, particularly in the branch of population ethics. Some of the strategies that have been put forward to resolve the RC include adopting an average principle, a variable value principle, or some kind of critical level principle. However all of these supposed resolutions are either wrought with their own problems (if accepted) or they are highly unsatisfactory, unconvincing, or very counter-intuitive. A brief overview of the argument and the supposed solutions and their associated problems can be found here. If one wants X above all else, then one ought to Y above all else. Since it can be shown that ultimately what one wants above all else is satisfaction and fulfillment with one’s life (or what Aristotle referred to as eudaimonia) then one ought to do above all else all possible actions that will best achieve that goal. The actions required to best accomplish this satisfaction can be determined empirically (based on psychology, neuroscience, sociology, etc. ), and therefore we theoretically have epistemic access to a number of moral facts. These moral facts are what we ought to do above all else in any given situation given all the facts available to us and via a rational assessment of said facts. So if one is trying to choose whether one population is better or worse than another, I think that assessment should be based on the same egoistic moral framework which accounts for all known consequences resulting from particular actions and which implements “altruistic” behaviors precipitated by cultivating virtues that benefit everyone including ourselves (such as compassion, integrity, and reasonableness). 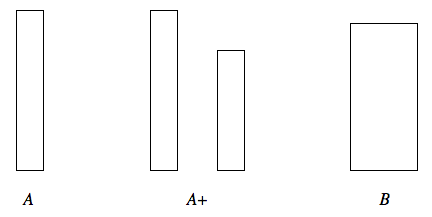 So in the case of evaluating the comparison between population A and that of A+ as presented by Parfit, which is better? Well if one applies the veil of ignorance as propagated by the social contract theories of philosophers such as Kant, Hobbes, Locke, and Rousseau, whereby we would hypothetically choose between worlds, not knowing which subpopulation we would end up in, which world ought we to prefer? It would stand to reason that population A is certainly better than that of A+ (and better than population B) because one has the highest probability of having a higher level of well-being in that population/society (for any person chosen at random). This reasoning would then render the RC as false, as it only followed from fallacious reasoning (i.e. it is fallacious to assume that adding more people with lives worth living is all that matters in the assessment). Another fundamental flaw that I see in the premises is the assumption that population A+ contains the same population of high well-being individuals as in A with the mere addition of people with a somewhat lower level of well-being. If the higher well-being subpopulation of A+ has knowledge of the existence of other people in that society with a lower well-being, wouldn’t that likely lead to a decrease in their well-being (compared to those in the A population that had no such concern)? It would seem that the only way around this is if the higher well-being people were ignorant of those other members of society or if there were other factors that were not equal between the two high-well-being subpopulations in A and A+ to somehow compensate for that concern, in which case the mere addition assumption is false since the hypothetical scenario would involve a number of differences between the two higher well-being populations. If the higher well-being subpopulation in A+ is indeed ignorant of the existence of the lower well-being subpopulation in A+, then they are not able to properly assess the state of the world which would certainly factor into their overall level of well-being. In order to properly assess this and to behave morally at all, one needs to use as many facts as are practical to obtain and operate according to those facts as rationally as possible. It would seem plausible that the better-off subpopulation of A+ would have at least some knowledge of the fact that there exist people with less well-being than themselves and this ought to decrease their happiness and overall well-being when all else is truly equal when compared to A. But even if the subpopulation can’t know this for some reason (i.e. if the subpopulations are completely isolated from one another), we do have this knowledge and thus must take account of it in our assessment of which population is better than the other. So it seems that the comparison of population A to A+ as stated in the argument is an erroneous one based on fallacious assumptions that don’t account for these factors pertaining to the well-being of informed people. Now I should say that if we had knowledge pertaining to the future of both societies we could wind up reversing our preference if, for example, it turned out that population A had a future that was likely going to turn out worse than the future of population A+ (where the most probable “well-being rating” decreased comparatively). If this was the case, then being armed with that probabilistic knowledge of the future (based on a Bayesian analysis of likely future outcomes) could force us to switch preferences. Ultimately, the way to determine which world we ought to prefer is to obtain the relevant facts about which outcome would make us most satisfied overall (in the eudaimonia sense), even if this requires further scientific investigation regarding human psychology to determine the optimized trade-off between present and future well-being. As for comparing two populations that have the same probability for high well-being, yet with different populations (say “A” and “double A”), I would argue once again that one should assess those populations based on what the most likely future is for each population based on the facts available to us. If the larger population is more likely to be unsustainable, for example, then it stands to reason that the smaller population is what one ought to strive for (and thus prefer) over the larger one. However, if sustainability is not likely to be an issue based on the contingent facts of the societies being evaluated, then I think one ought to choose the society that has the best chances of bettering the planet as a whole through maximized stewardship over time. That is to say, if more people can more easily accomplish goals of making the world a better place, then the larger population would be what one ought to strive for since it would secure more well-being in the future for any and all conscious creatures (including ourselves). One would have to evaluate the societies they are comparing to one another for these types of factors and then make the decision accordingly. In the end, it would maximize the eudaimonia for any individual chosen at random both in that present society and in the future. But what if we are instead comparing two populations that both have “well-being ratings” that are negative? For example what if we compare a population S containing only one person that has a well-being rating of -10 (the worst possible suffering imaginable) versus another population T containing one million people that have well-being ratings of -9 (almost the worst possible suffering)? It sure seems that if we apply the probabilistic principle I applied to the positive well being populations, that would lead to preferring a world with millions of people suffering horribly instead of a world with just one person suffering a bit more. However, this would only necessarily follow if one applied the probabilistic principle while ignoring the egoistically-based “altruistic” virtues such as compassion and reasonableness, as it pertains to that moral decision. In order to determine which world one ought to prefer over another, just as in any other moral decision, one must determine what behaviors and choices make us most satisfied as individuals (to best obtain eudaimonia). If people are generally more satisfied (perhaps universally once fully informed of the facts and reasoning rationally) in preferring to have one person suffer at a -10 level over one million people suffering at a -9 level (even if it was you or I chosen as that single person), then that is the world one ought to prefer over the other. Once again, our preference could be reversed if we were informed that the most likely futures of these populations had their levels of suffering reversed or changed markedly. And if the scenario changed to, say, 1 million people at a -10 level versus 2 million people at a -9 level, our preferred outcomes may change as well, even if we don’t yet know what that preference ought to be (i.e. if we’re ignorant of some facts pertaining to our psychology at the present, we may think we know, even though we are incorrect due to irrational thinking or some missing facts). As always, the decision of which population or world is better depends on how much knowledge we have pertaining to those worlds (to make the most informed decision we can given our present epistemological limitations) and thus our assessment of their present and most likely future states. So even if we don’t yet know which world we ought to prefer right now (in some subset of the thought experiments we conjure up), science can find these answers (or at least give us the best shot at answering them).